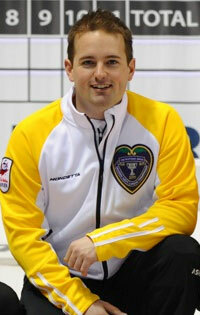 This week’s male Athlete of the Week is Reid Carruthers of Winnipeg, Manitoba. A season of adjustment for Reid Carruthers produced a new team, a new delivery and a long-awaited new Team Manitoba jacket, with a Purple Heart to go along with it. 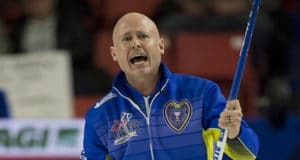 The life-long Winnipeger couldn’t resist the opportunity when he was asked following the 2009-10 curling season to join Jeff Stoughton’s Manitoba powerhouse team as a second. 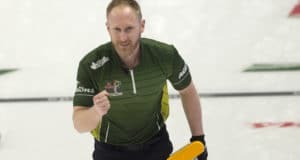 Carruthers was well-known as a back-end player, having won a provincial junior championship in 2003 and a provincial mixed title in 2007 as a skip, and reaching the final of the 2006 Manitoba men’s championship calling the shots. But when he accepted Stoughton’s offer, there was a proviso — Carruthers was facing knee surgery, and was going with a new delivery for the 2010-11 season, going from a traditional Manitoba toe-sliding tuck to a flat-footed style. It was no problem, as it turned out. Carruthers has been solid all season at second for the Stoughton team, which is rounded out by lead Steve Gould and third Jon Mead. 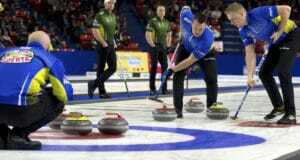 The new lineup has produced runner-up finishes in two Grand Slam events this season, and a semifinal placing in another, to go along with the victory at the Manitoba men’s championship to earn a berth in the Tim Hortons Brier in London, Ont. 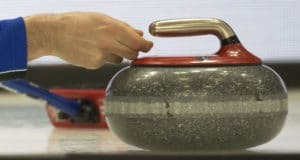 It will actually be Carruthers’ second trip to the Brier; he was the alternate for Kerry Burtnyk’s team for the 2008 Brier in Winnipeg, and he appeared in one game. Carruthers has put in his time as a volunteer at various summer curling camps over the years, and also helped coach Holly Scott’s up-and-coming women’s team.